The dual motion gripper products offer O-ring and seal placement capabilities for assembly lines and single station hand assists. 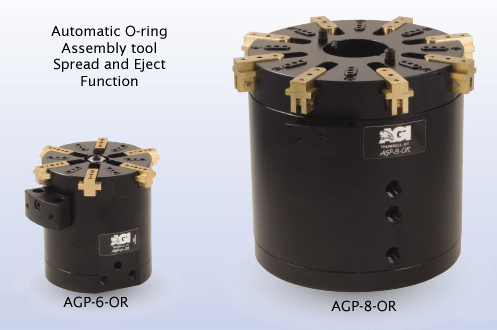 AGIs O-Ring assembly tools are available in two sizes to accommodate placement applications ranging from 3 to 12 inch I.D. Both the AGP-6-OR (which has six jaws) and the AGP-8-OR (which has eight) are designed to facilitate part ejection and part seating and are ideal for applications where an ejector is needed after part placement. They are both equally functional when a seal needs to be placed down a long shaft. As a result of independent piston technology and double-acting spreading jaws, O-Rings that are stretched by these pneumatic grippers suffer considerably less deformation than they would if installed through traditional assembly methods. And there is no risk of over-expansion, as the opening stoke can be precision-adjusted. something both workers and their employers benefit from. When manufacturing workers sustain injuries, there are implications to productivity and scheduling. Manufacturing outfits that embrace new technologies are finding themselves ahead of the curve as a result of decreased injuries among their staff.